Tutters Two is a beautiful oceanfront condo. 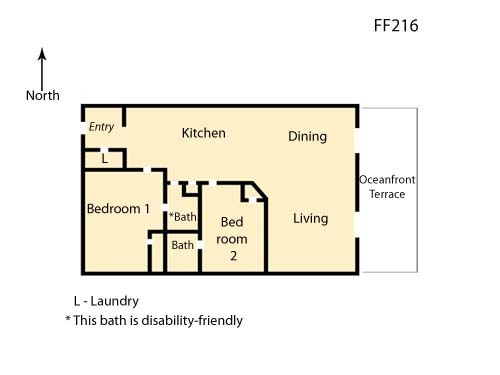 It is wheelchair friendly, and an end unit with windows on two sides for maximum ocean views. One of the two bathrooms has a roll-in-shower for easy wheelchair access and all doorways are wider. From the private balcony with 2 pub tables and 4 pub chairs, enjoy stunning ocean views. perfect for enjoying your morning coffee while watching amazing sunrises and maybe even a delightful dolphin display. The open kitchen, with granite counters, is well stocked with everything a cook could want. There is a breakfast bar with stools for extra seating. Amenities include - TVs and a DVD player and WiFi, a pack-and-play and a storage unit on the garage level adds storage for all your beach equipment. 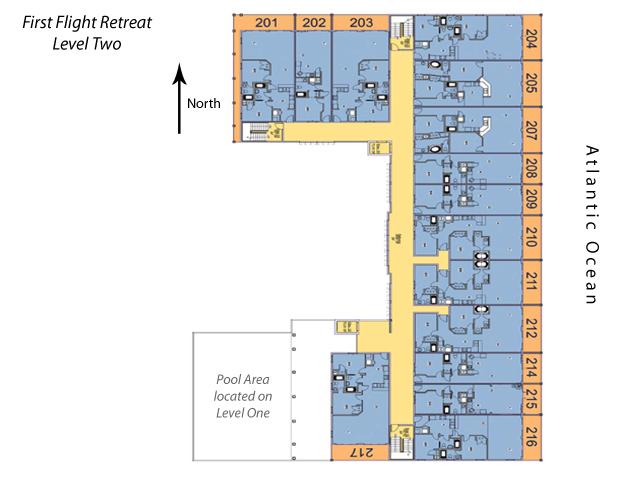 Condo amenities include covered parking, elevator, saltwater pool, in-ground hot tub, kiddie pool, game room, fitness room, picnic area with BBQ grills and tables and an accessible walkway to the beach. Awesome condo! Great location to restaurants and fun things to do. Village reality was great and the app made it easy. The condo itself was fabulous! It was very nice, well maintained and magnificent view of the beach. We will be back. We enjoyed our stay at Tutters Two. The FF Retreat complex is easy access to the beach and had some fun amenities. Upon arrival our condo was neat and tidy. Kitchen supplies were adequate but I will say I've never stayed in a condo that doesn't have a few basic provisions like salt or sugar (my guess is this is due to a shortage of storage/pantry space). Perfect ocean views. We love the key-less entry system which makes everyone's comings and goings easier. The bed was super comfortable. And we were happily surprised to see the furniture and flooring in the living room was recently updated! We loved the condo and the area and really hope to visit there again next year. The views from the balcony of the sunrise and the strawberry moon were breathtaking! My only critique is not of the condo, but of the rental company. We had difficulty finding the location. The address provided did not work on 2 different GPSes and we had to stop at 2 places to finally find someone that could help us find it. The building is actually about 3/4 mile north of where the GPS said it was. Maybe give future visitors a heads up or at least provide a phone number where they can get a hold of a live person instead of vmail in case they get lost. I would think this would be standard since people typically check in on weekends. We had a frustrating hour or two trying to find the place after a long day of driving. All I was able to do was leave vmails and I didn't get a return call until the next day. After that trying time,,, we did end up having a wonderful vacation! The place is great! We are pleased to hear you enjoyed your property FF216 Tutters Two. The views really are breathtaking. We are so sorry for any miscommunication on our part regarding difficulty finding your condo or reaching us on check in day. For guests who have downloaded the Village Realty app, we share the homes physical address and keyless entry code which allows them to go straight to their rental home on check in day. We also provide check in packets with maps for those guests who have not downloaded our Village Realty app. Our afterhours assistance is available 7 days a week at (252) 202-8670 should our office be closed. We are glad to hear you did end up having a wonderful vacation Lisa, and look forward to welcoming you back to the Outer Banks for another great year. This was our second year here, and it was another great week. The condo is comfortable and fairly well furnished. However, the photos on the website are no longer up-to-date. The nice white leather chair shown (which was very comfortable) is not longer there. It was replaced by a chair that is very uncomfortable and basically unusable. Too bad! - Also, we suggest that the rental agency advise renters how to enter the game room and fitness center, which they DO NOT do unless you call them. Overall, we do highly recommend this condo. We cannot thank you enough Albert for staying with Village Realty while visiting the OBX, especially in the same property for the 2nd year in a row. You are correct, FF216 Tutters Two really is a comfortable condo along with fantastic views of the ocean. In regards to the photos online, there are times home owners will update/replace furniture in a property, and we do our best to keep the pictures up to date. The Village Realty App is also a great resource for information needed during your stay, such as the entry code to the pool and beach access (along with all common areas). Again we are so glad to hear you enjoyed your recent trip here on the Outer Banks, and look forward to welcoming you back again next year. Loved our first visit to the Outer Banks! Tutters Two is a lovely place to call home while at the beach. We arrived to a beautifully cleaned condo. A few changes in furniture have been made but we were very comfortable. We spent the first week of May there and didn't realize that the pool would be closed for our entire visit. Not the worst thing but would have been good to know. Our favorite spot was the balcony looking out at the ocean. Comfortable seats...We ate a few meals out there. The handicapped accessible bathroom was a blessing to find. So rare and it was put to good use. Place was great! We loved it!